On Saturday I dragged myself out of bed early to catch a 7am train to Southern Cross station. I had committed myself to journeying with a party of Greens supporters, including the State MP for Melbourne Ellen Sandell and the Federal MP Adam Bandt, to the town of Morwell in the heart of the LaTrobe Valley. This is where much of Victoria’s electricity is generated from three huge thermal power station complexes and three huge open cut mines where lignite is easily extracted. I travelled to Morwell to listen to members of the local community on the future of coal, and their concerns over health and economic transitioning. Some of them understand that the future of coal is coming to an end and requires transition planning, and this needs to be done actively on a local community level. Morwell is a town of 14,000 with the Hazelwood open cut pit within a few hundred metres of the south side of the town. On the south side of the pit sits Hazelwood power station, owned by GDF Suez Australian Energy. 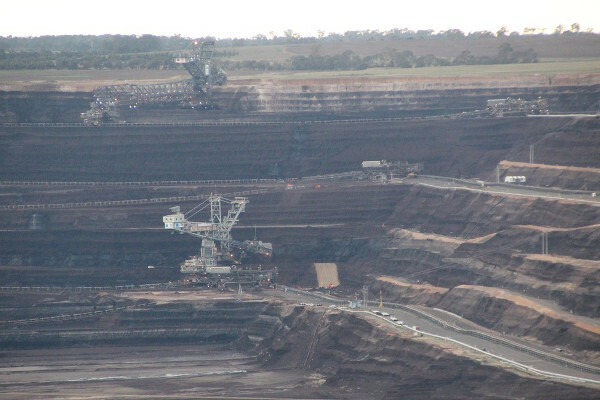 About 100,000 people live within 20 kilometres of this mine. There was a major mine fire at Hazelwood in February-March 2014 that became one of Victoria’s worst industrial disasters, provided a wakeup call to the local community. Hazelwood is one of the most polluting power stations, not only in Australia but in the industrial world, according to the OECD, both in regard to the toxic cocktail of chemicals it daily emits into the air and water, and the carbon emissions intensity it spews into the air of the Latrobe Valley. Carbon emissions are currently 15.5 MT CO2e per year, with carbon intensity of 1.4 Tonnes CO2/MWh. Just this one facility produces about 15 per cent of Victoria’s total carbon emissions. The power station is also a major consumer of water: 1.31 megalitres of water is consumed per gigawatt hour of power generated. While ensuring the growth of renewables is important, ultimately closing the ageing power stations like Hazelwood that generate high carbon emissions is essential to ensure a safe climate for ourselves and future generations. To ensure we stay under the two degree Celsius limit that all government’s that are signatories of the United Nations Framework Convention on Climate Change (UNFCCC), including Australia, agreed to do at Cancun in 2010. The morning was spent at Morwell Neighbourhood house hearing a number of presentations from Voices of the Valley, Latrobe Valley 1st former independent candidate Tracie Lund, Tom Doig on a brief history of coal in the Latrobe Valley, Community over Mining campaigner Tracy Anton, Latrobe Valley Sustainability Group member Daniel Caffrey, representatives from the Earthworker Co-operative on building worker owned co-operative businesses, as well as a Hazelwood Power Station employee. While those we heard from have a positive vision for the Valley, many in the local community are in denial, on the need to transition away from coal, and on climate change. Their world and employment is under threat by city activists (like myself) and climate change scientists who are a world away from the coal face. When your reason for work and existence is threatened, denial is a place of safety to retreat to. Coal is part of the life and the heritage of this community. It has provided a sense of pride, and a valued sense of contribution to industrial society. This is despite the negative health impacts of living in a coal community, with the hazards of coal pollution that sometimes blankets the valley due to an inversion layer. Indeed, the health impacts of coal have been well known for many years. Black Lung, a lung disease caused by inhaling coal dust over a long period of time, was the coalminers scourge. I reviewed in 2010 a Physicians for Social Responsibility (USA) comprehensive report on ‘Coal’s Assault on Human Health’. The Climate and Health Alliance (CAHA) estimated the costs of health damages associated with coal combustion for electricity in Australia amount to $2.6 billion per annum. It is a social cost that falls particularly heavily on communities like Morwell in the LaTrobe Valley, or in the Hunter Valley with substantial coal mining and coal fired electricity generation, but every tax payer bears some of this expense through the public health system. It is, in effect, a $2.6 billion subsidy for the coal industry, on top of approximately $10 billion in Federal Government subsidies to the fossil fuel mining industry every year. 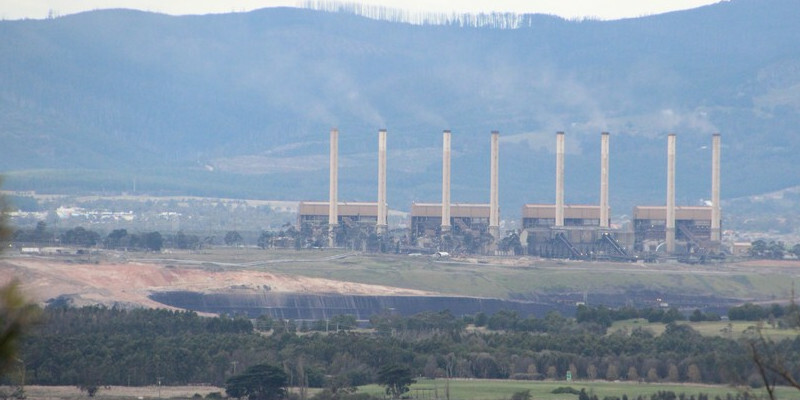 A recent report prepared for Environment Victoria estimated the annual health costs of coal-fired power for Victoria at $831.5 million and the annual social carbon costs at $2.882 billion, according to The Age report. Latrobe Valley residents, according to a Department of Health study from 1996 examined by the Mine Fire Inquiry, already suffer 3.9 years for men and 2.8 years for women less life expectancy, than the average Victorian. After the morning presentations and lunch, we boarded a bus for a tour of the three coal mines and their power station complexes. We were given a running commentary on life in Morwell under the SECV and under the private corporations. Hazelwood Power Station from Yallourn. Three energy companies exploit the coal resources of the Latrobe Valley to turn a profit for their shareholders. 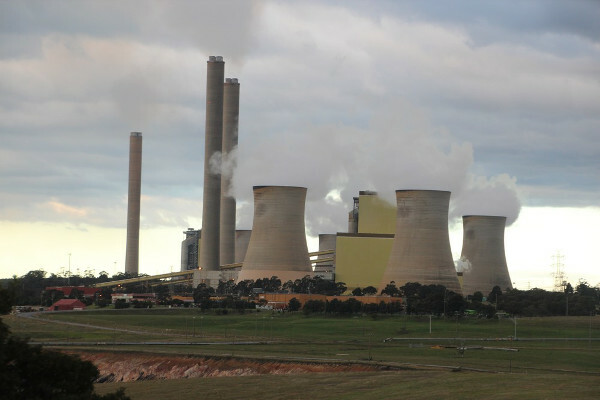 International Power manages Hazelwood mine and power station. GDF Suez Australian Energy, a subsidiary of the French multinational GDF Suez, have a 70 per cent stake in International Power. Japanese energy company Mitsui provides the other 30 per cent investment. 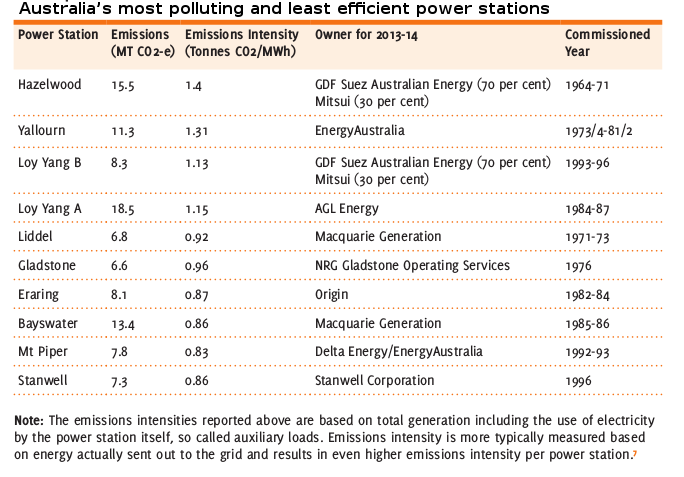 GDF Suez is listed as Number five in the top ten most polluting companies in Australia by the Australian Conservation Foundation. GDF Suez and Mitsui also own Loy Yang Holdings that manages the Loy Yang B power station, and various gas peaking power stations and the energy retailer Simply Energy. There is no record of GDF Suez making political donations for 2013-14. The Yallourn power station is owned by EnergyAustralia, a Hong Kong based Chinese power company and number one in the top ten most polluting companies in Australia by the Australian Conservation Foundation. During the 2013-14 financial year EnergyAustralia donated $14,050 to State and federal Labor Party, and $32,175 to state and federal Liberal Party. 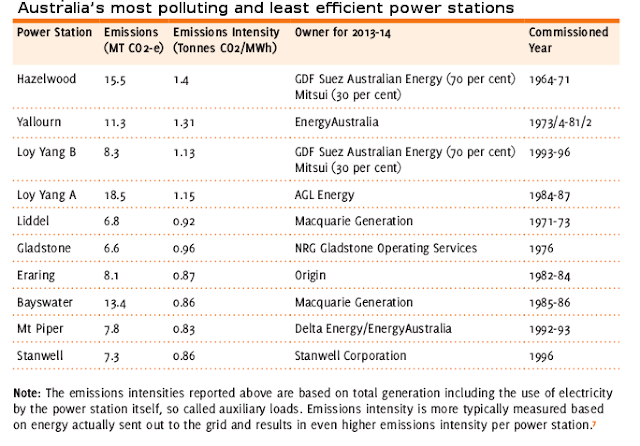 Loy Yang A Power station is owned by AGL Energy listed as number three in the top ten most polluting companies in Australia by the Australian Conservation Foundation. The recent acquisition of Macquarie Energy will nominally boost this company to Number 1 position of big polluters. In 2013-14 AGL Energy donated $65,608 to State and Federal Labor Party, and $96,680 to Coalition (State and Federal). To understand this community and it’s fear of the threat of closure of coal mining and thermal power generation one needs to understand what this community went through with privatisation and breakup of the State Electricity Commission of Victoria (SECV) during the 1990s. Mining and burning coal has been a part of this region for nearly 100 years. Generations have lived and died digging the lignite and working in the electricity industry supplying the power for the bright lights of Melbourne and other regional towns. And they did so ensuring high availability of generation equipment with in house maintenance and dedicated fire crews. The SECV managed the mines and the power stations and provided gainful employment to tens of thousands of people directly, and supported many more indirectly through money flowing around the community supporting shopkeepers and other businesses. The rationale for the SECV was to provide cheap electricity for Victorians. As a government instrumentality it was not motivated by the profit motive. But it was a large hegemonic organisation with both good and bad aspects. It was part of and helped create the politics of the state. With the rise of neo-liberalism in politics in the 1980s and particularly in the Liberal Party, the SECV was a rife candidate for privatisation, and deregulation of the power industry. Breaking up the SECV was initially done on the basis of four separate businesses: power generation, transmission, local distribution and retail. Private companies were initially prevented from owning businesses across the vertical structure. But as time as shown this is not a naturally competitive industry, regulations on cross ownership have been relaxed resulting in private companies now owning from generation to retail. The Victorian state government benefited by the one-off sale and injection of revenue into the state coffers. Private power companies paid the asking price and then sort to make their businesses more efficient to maximise profits for their shareholders. This included outsourcing and reducing maintenance and reducing staff numbers through redundancies and eliminating apprenticeships. During the privatisation debate, communities were advised that the industry would still be well regulated by the government. During 1990s, employment by the private power companies dropped from about 11,000 to about 2,500 employees. Much coal production expertise was lost during this period. If a skill wasn’t directly related to production, it was seen as superfluous. A Large dedicated fire staff? Why employ so many when the local CFA can be called in to assist. People who understand the combustion properties of brown coal? It burns, we don’t need them. As apprenticeships were culled, information was lost from being passed on to new generations of workers. Other than the redundancy packages, there was little offered in economic transition of the community by the Government. No alternative industry support schemes. Instead of the benevolent bureaucracy of the SECV providing gainful employment opportunities to those across a wide variety of education and skills backgrounds, the Federal Social Security system was left to pick up the tab of those seen as unproductive by the new corporate owners. The community was left with little support and very little employment future for the kids growing up in the towns in the region. As one speaker at the Morwell Neighbourhood House said “Privatisation was so poorly orchestrated”. Effectively, the Morwell and Valley community were kicked in the head by the commitment of the State Government to privatisation of the SECV during the 1990s. The companies that have moved in have driven efficiencies in their business, by socialising and externalising some of the costs which are now born by the wider Victorian community and residents of Morwell, Moe and Traralgon in particular. Mine infrastructure such as ageing water sprinkling systems were left corroding and un-maintained until eventually removed. Sections of the mine no longer being worked have been left unrehabilitated. The mine fire was an industrial disaster waiting to happen. And with climate change driving rising temperatures and more frequent heatwaves, making bushfires more prevalent and intense, disaster was waiting to strike. Climate change is seldom talked about in Morwell, and if it is, people either retreat into denial or avoidance as it threatens the continuance of their long association with their coal heritage. And Privatisation has taught them to be suspicious of change and promises from the government. The 2014 mine fire in the Hazelwood pit was a huge wakeup call to many in Morwell and the Latrobe Valley. The work of Tracie Lund, the co-ordinator of Morwell Neighborhood house and other residents, worked tirelessly organising community outreach, gathering and disseminating information during the disaster. A community protest of at least 1500 people in Morwell on 2 March, 2014 accused the Government of lying and subterfuge in informing the community on health risks from the smoke and ash. As part of organising this protest, Voices of the Valley community group was established. I happened to sit next to Tom Doig on the train to Morwell. He is doing a journalism PhD around the Morwell community and the mine fire. An early outcome of his research was the publication early this year of his informative little book, ‘The Coal Face’, which describes in gripping detail the events of February and March 2014 and the community awakening on the health impacts of coal and betrayal by the Government, and health officials. It is recommended reading and tells the moving story of a community finding it’s own voice for change and transition. Great investigative journalism. Ignited by bushfires in the heat of summer, the fire in the Hazelwood open cut mine lasted for 45 days sending choking smoke containing ash, carbon monoxide and particulates over Morwell and through most of the Valley towns. There was a huge incidence of people reporting sickness from breathing the smoke, dead pets and chickens, or trying to clean the ash from their houses. The advisory call for vulnerable people to evacuate was made over two weeks into the disaster, and the relocation advice only applied to a relatively small proportion of the town, while ill effects were very widespread, not just in Morwell but in other towns across the Valley. The toxic smoke spread but was held in the valley close to the ground by the atmospheric inversion layer of the region. Those with little support had to stay and bear the choking smoke and ash. But many people in the town decided to relocate to neighbouring towns like Traralgon and Moe, the irony being that neither of these towns may have been particularly safe from the toxic smoke and particulates. The Environment Protection Authority (EPA) also came in for criticism for not responding quickly enough and reporting pollution measurements. The Mine Fire Inquiry found “the EPA was ill-equipped to respond rapidly”. An assessment done for Voices of the Valley said at least 5 more comprehensive measuring sites were needed around the Valley to give an accurate idea of regional pollution levels. An under resourced EPA is just part of the poor regulation of coal in the Valley under privatisation. The mine fire signifies an enormous health and safety issue for the community. Locals feel they were continuously lied to and kept in the dark by the Health Minister and Chief Scientist, and their local member of parliament Russell Northe. They were reassured that breathing the smoke and cleaning up the ash was harmless, when carbon monoxide and particulates measurements were regularly exceeding safe levels. 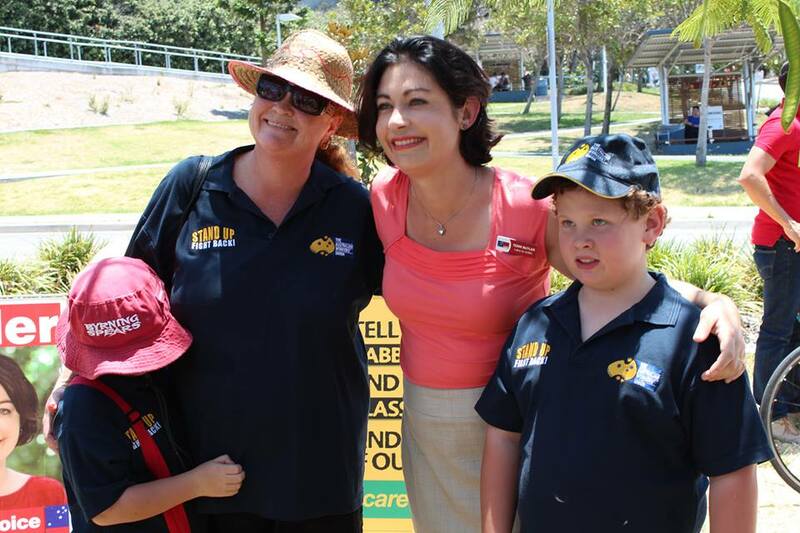 One of the significant wins by the community from the Minefire inquiry was a long term (20 year) health study. But they also want health resources put into righting the historic health deficit of the region. The Mine Fire Inquiry proposed creation of a Health Conservation Zone in the Latrobe Valley. 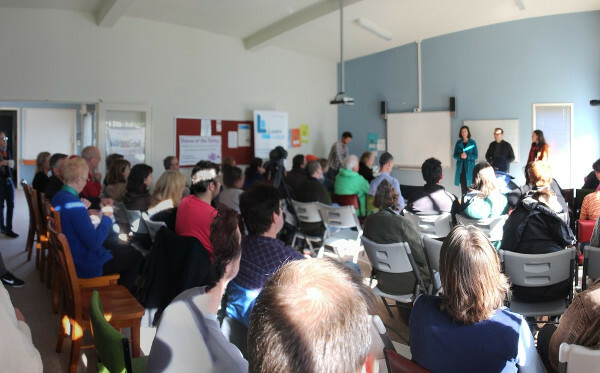 “The purpose is to improve significantly the health of the Latrobe Valley community by coordinating and integrating health services with responses which tackle the broader social and environmental determinants of health.” Local residents are adamant they want their community to be safe to live in, and the necessary regulations and support by Government needing to be put in place. An analysis done by Voices of the Valley showed that there had been a statistically significant increase in deaths in the region due to the mine fire. The information was too late to be considered by the Mine Fire Inquiry, but was noted by the Board as significant and should be investigated. Statistically, there were at least 11 excess deaths, after adjusting for temperature, due to the mine fire. Much of the data on sickness and mortality was initially collected by Voices from the Valley and through Morwell Neighborhood house. Voices of the Valley called for a reopening of the minefire inquiry, which then opposition leader Dan Andrews agreed to. Earlier this year the new Labor Government kept it’s promise and announced the Mine Fire Inquiry would re-open and would look at the health morbidity and mortality statistics and also mine rehabilitation. Companies have only lodged bonds of $15 million for rehabilitation, when the costs may range from $80 million to $300 million to rehabilitate a mine. The fear of residents is that companies like GDF Suez will shutdown and leave the community forfeiting an inadequate bond and leaving substantial rehabilitation work to be done and plant to dismantle. Effectively, socializing the costs involved with closure. A report released in October 2014 by Environment Victoria found that 450 long term jobs over a 20 year period could be created in the Latrobe Valley if rehabilitation work was accelerated. 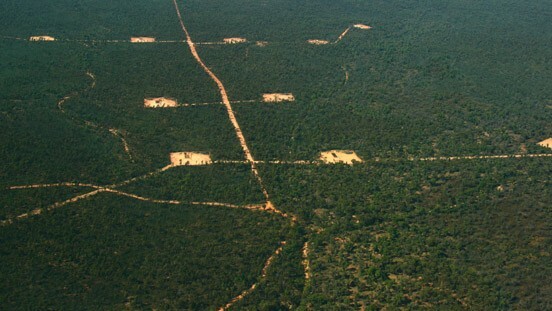 This would have the double benefit of helping to prevent another minefire disaster. People want to see a positive future for their community and their kids. There is some understanding that an economic transition for the region is important. There are large changes in the power industry, from the rise of wind and solar renewables to the advent of new battery technologies. Funnily enough, on the hills around the Valley I could see are no wind farms. A quick check of Wind projects in Victoria shows that only one project in the Latrobe Valley is under consideration at the moment: Future Energy’s 3 turbine 6 MW Yallourn wind farm presently in the feasability planning stage. Some have suggested that solar farms could utilize rehabilitated open pits. There is a suggestion that pumped hydro could be utilised using the depth of the open pit and the existing power station storage ponds to provide baseload power smoothing the intermittency of renewables. Perhaps the idea of establishment of an Energy Research Institute would provide valuable and high paying employment opportunities, or industries that can leverage the areas skills in light and heavy manufacturing. There is certainly a place for tourism and gourmet agriculture as well in the rich fields of the Valley. Whatever the ideas, a more diverse economy with transition planning that engages the local community is required. As the age of coal ends, the State and Federal Governments need to step up and engage with local people to plan the economic and social transition for the region. Christiana was deeply moved in hearing about the pollution challenges facing the Latrobe Valley community now, the inaction of our governments in planing & building cleaner, fairer futures, and by (our!) Earthworker Cooperative’s vision and work for worker-owned renewable energy manufacturing. We were stirred by Christiana’s enduring commitment to global action on climate and a just transition. What is needed is an economic transition plan for the Latrobe Valley, driven by community engagement that considers the needs of the community. Hazelwood, Yallourn and Loy Yang A and B power stations all need to be closed eventually and replaced by a clean energy future with a range of skilled employment and service industries. If we can get it right in the Latrobe Valley it would be a valuable blueprint to inspire and share with other coal communities around the world, as we face the challenges of climate change. I am not the only one connecting with the Morwell community. Charlie Wood and colleagues from 350.org Australia spent a weekend in Morwell a few weeks ago and wrote this powerful account: The Valley of Hope. Stuart, in the comments below, has pointed out that not all business political interactions involve donations of money to political parties. Dan Tehan, Federal Liberal MP for Wannon in the western district of Victoria, and his wife, received free tickets to the Australian Open Men’s Tennis Final in 2014 from GDF Suez, the majority owners of the Hazelwood and Loy Lang B coal power stations. Such gift was declared in the Register of Members’ Interests. We will probably never know what was discussed, other than the tennis, between GDF Suez executives and Dan Tehan. Gifts such as these are one way business has a direct influence on political representatives. Note: I am not a member of the Greens, nor of any other political party. 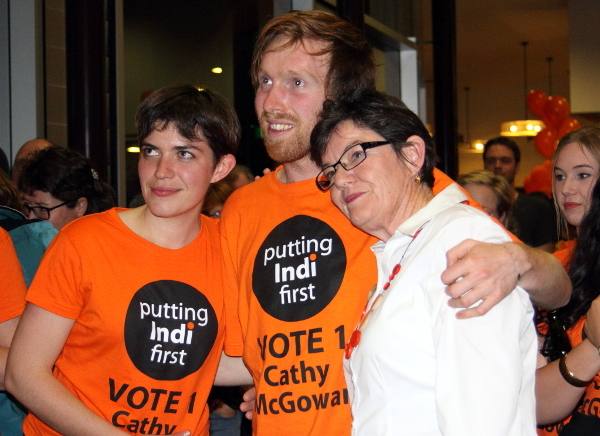 I travelled to Morwell with the Greens as a climate journalist and activist, a member of Climate Action Moreland. GDF Suez doe support the politicians, they took the federal liberal member for Wannon (Dan Tehan & wife) to the Mens Final of the Australian Tennis Open in the 2013-2014 financial year. Not a donation as such but just a nice, cosy chat. Thanks Stuart. I have updated the article at the bottom with this information.